Owning Bitcoin might give your inner crypto-anarchist a bit of a rush, but the currency lacks the tactile fat-cat feels of physical notes in your wallet. Plus, only dealing with currency in the ether can make Bitcoin insecure and difficult to use. Case, a Bitcoin wallet that fits in your jeans, hopes to solve those problems. 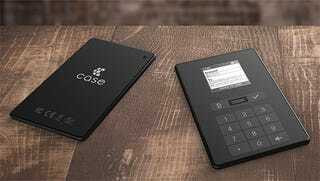 Case is a device a little smaller than your smartphone, with just a tiny screen, a keypad, a fingerprint scanner, and global SIM card. The idea is that you can send and receive Bitcoin transactions with complete security anywhere in the world, without needing to rely on a third-party service that’s vulnerable to hacking (or, for that matter, super-secure but super-annoying paper wallets). In theory, Case seems like the perfect solution for anyone who trades Bitcoin face-to-face on a regular basis. But that’s the problem — Case is probably a solution well ahead of its time. At a price of $200, its list of potential customers all probably know each other well enough to just give each other the keys to their wallets.